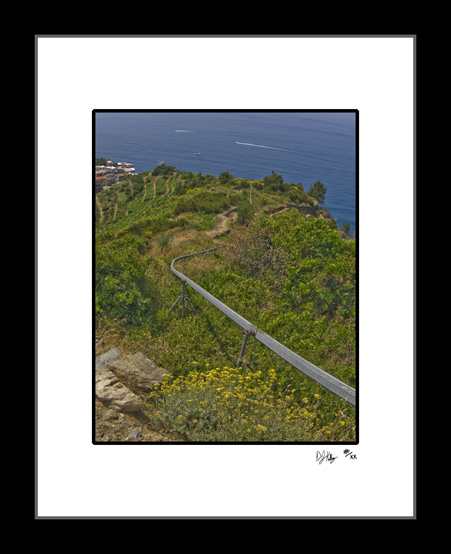 This photograph of one of the many grape lift tracks used in Cinque Terre, Italy was taken during summer trip to the coastal towns of Italy. The towns of Cinque Terre stretch from the ocean all the way up into the mountains above the sea. These lifts allow the farmers to transport their grapes from high in the mountains down to the towns and the sea without carrying them by hand. The town of Corniglia is connected to the other towns of Cinque Terre by rugged paths used for centuries before roads were built. This colorful photo shows the stunning beaches, coastal town, and the mountains that make the Italian sea famous.